I have soooooooo much to be thankful for… my 3 girls, the fact that in 2 months Ally will be “4 YEARS OLD” and she is changing me and the world, everyone who has helped with Ally and our family – docs, nurses, therapists, teachers, Horizon, MDA, FSMA, SMA Support, SMA Space, other sma families, family & friends….MY MOM who lets us share her home and helps in some great way(s) daily, my hubby who really does a ton for our family and works very hard at his job, Make a Wish and CRASH for making Ally’s Dream Deck with hottub come true…. and God and the angels for all of the above things and for giving me mental strength and inspiration when times get tough, and blessing me and our family with the happy, healthy times. Small update — Ally is doing VERY well (knock on wood). She fought small colds off and on in Oct and Nov and then had a high fever a week ago with increased thick secretions. With antibiotics, extra treatments and prayers, she avoided a hospital stay (first time being able to fight an illness at home in over a year without collapsing a lung). This week has been amazing for her! She has been back in her stander for 1 hour at a time, sat in her loaner power chair for 1-2 hours after it was adjusted (but the battery wouldn’t work – we’ll try again today since it seems to maybe be better), did amazing in her 3 days of homebound school with assisted coloring, projects and using her Eye Gaze computer, and just has been soooo happy and had wonderful sats. Our main nurse, Maribel, has also decided that she will go full time with us 30-40 hrs per week (and I plan to share her 1 day with a newer sma family). Unfortunately we lost a part-time nurse, Kate, for a little while during minimally her first trimester of pregnacy, but we are praying for her and her baby and also that she will return when the time is right. Ally also has a NICU nurse, Lucy, who lives 3 blocks down the street and works 2-4 times a month – hoping to make that 4 or more times (even if some are 1/2 days). I need to incorporate our last, part-time nurse, Rosalyn back into the schedule too but it is hard with the holidays (and pray it will work with her family). Some weeks we have only had 1-2 days of covereage and some 3-5 days. Ally qualifies for 7 days a week/ 14 hours a day and more with respite, but its not worth having all those hours filled unless you have great, qualified, caring, responsible nurses. I’m dreaming and praying we will find one more nurse to work with us part time. RNs make $26 hour and I need them to work preferable 1-2 times a week 4-12 hours a time, minimally 2-4 times a month. Know anyone interested?? My absolute dream is to convince one of our buddies from Childrens PICU to join our team. Hopefully, our prayers for the right nurses will be answered soon. Other GREAT news, some of you might have read on Facebook. Ally’s Dream Deck is complete – HUGE thanks to CRASH of Chicago, Airtite, Pepper and Several other companies!!!!!! 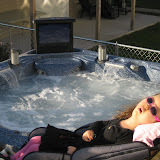 And her Hot Tub from Make a Wish is installed and running. Billy, the older girls, and I tried it out last night in 40 degree weather and set at 104 degrees — it was absolutely AMAZING!!! I think it also helped me with a better night sleep. Can’t wait till spring so Ally can swim in it and move her arms and legs to the beat of the music or musical movies since it has pop up stereo speakers and a TV. We plan to bring Ally out on the deck this winter for fresh air. Both of these are huge positives in her and our families life and will make spending time together even more enjoyable. Thanks again to everyone who made it possible. Well, better get to last minute cleaning for Thanksgiving and getting Ally and myself ready for dinner. My sisters and their families, and my dad are coming over (mom lives downstairs and is doing the majority of the work). 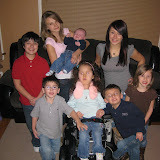 PS – Hope to post some pictures soon of deck and the girls, maybe one of all 8 cousins together today. Hope you enjoy the Halloween pics of Melissa and Ally. Didn’t get a chance to snap one of Kristyn in her Minnie costume. You know how teens are! Melissa and I went trick or treating on our block and then she LOVED giving out candy. Ally hung out in our living room in her Tinkerbell costume and a couple of neighbors stopped in to say “hello” while she watched some Halloween and other cartoons. Too cold and germy to bring her outside this year. Ally and I have had a small cold, but overall she is doing well, just more bi-pap and some extra breathing treatments. Kristyn went trick or treating with some friends but didn’t bring much candy home since she just got her new braces. She’ll be picked up in a few minutes to babysit tonight. She’s soooo grown up and earning her own $$$. Hope everyone else had a great Halloween and has a Healthy Fall!